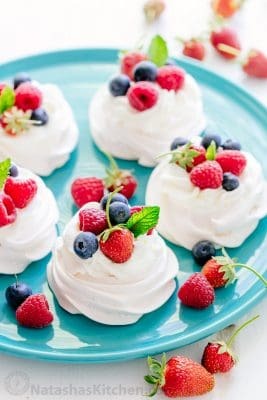 This Pavlova is a perfect dessert, crisp on the outside with marshmallowy goodness on the inside, piled high with fluffy cream and loads of fresh fruit. Using your stand mixer, beat 6 egg whites on high speed 1 min until soft peaks form. With mixer on, gradually add 1 1/2 cups sugar and beat 10 min on high speed, or until stiff peaks form. It will be smooth and glossy. Use a spatula to quickly fold in 1/2 Tbsp lemon juice and 1/2 Tbsp vanilla extract, then fold in 2 tsp corn starch and mix until well blended. Pipe meringue onto the parchment paper using a Wilton 1M Tip. Indent the center with a spoon to allow room for cream. Bake at 225˚ for 1 hr and 15 min then turn oven off and without opening the door, let meringue in the hot oven another 30 min. Outsides will be dry and crisp to the tap and very pale cream colored and insides will still be marshmallow soft. Transfer the pavlova with the parchment paper onto the counter or a cookie rack and allow it to cool to room temp. Once cool, you can top them with whipped cream and fruit or store in an airtight container for 3-5 days at room temperature. Beat cold whipping cream with 2 Tbsp sugar in the cold bowl for 2 to 2 1/2 minutes or until whipped and spreadable. Pipe frosting onto the pavlova and top with fresh fruit.